I bought a goat after all!...Just not for myself. Why would an artist spend hard earned money just for the chance of being in Spectrum? While the desire to have your work seen by art directors and production designers is clear, most artists point first to the satisfaction of being thought of as a peer amongst their colleagues and heroes. For a young up-and-coming artist, it can go a long way to validate the decision to embark on such an unpredictable future. The newcomer Daniel Dos Santos explains that, "there is nothing more rewarding than to see your artwork displayed next to the people who inspired you to enter the field in the first place!" Established artist, too, are not immune to the rush of being included in the annual. 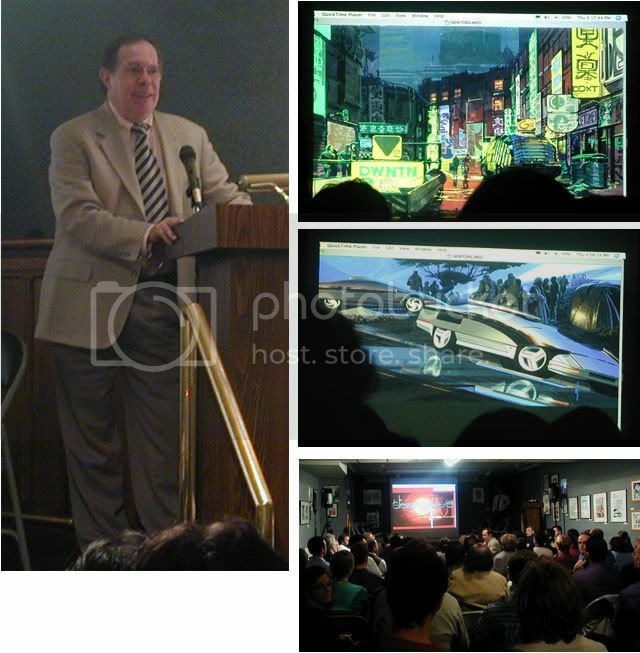 Gregory Manchess stated, "I love seeing my work next to artists like John Berkey, artists that I grew up admiring, and next to the young hungry artist just making their way up in the field. It keeps me from being complacent, it keeps the whole field energized." More practical and concrete concerns are, however, not far behind. It is advertising that money can't buy. Donato Giancola states, "My experience abounds with tales of referrals, licensing of commercial reproduction rights, new commissions, and original art purchases all stemming from my direct involvement with Spectrum. It has been one of the most instrumental aspects in the development of my reputation as a career artist." As a vetted publication, it is time effective, one-stop shopping for art directors, production designers, and fine art collectors world wide. A handy way to keep a year's worth of the field's best work at your fingertips. For a young artist, it can be the first time their work is being seen by thousands of potential clients, with the unspoken caption "best of the best." For the established artists it is always imperative to maintain visibility in the market place. With new art directors entering the field at all times, it is important for artists to make them aware that they are around and producing innovative work. 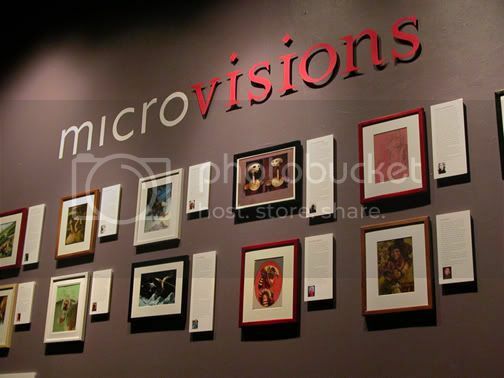 I'd like to thank Cathy and Arnie Fenner for graciously offering to let the paintings created for MicroVisons, a student scholarship fund raiser, free of the entry fee. Last April twelve artists dedicated their time and talent to create a miniature painting, just 5x7. The paintings were exhibited at the Society for a month and then auctioned on eBAy. They raised well over $5,000.00 for art students. 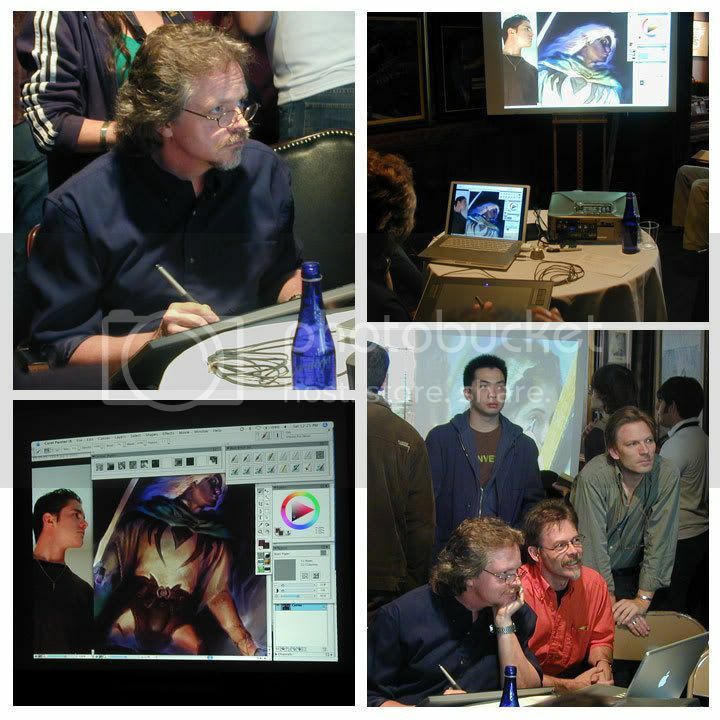 Huge thanks to Julie Bell, Bob Eggleton, Boris Vallejo, Greg Manchess, Dan Dos Santos, Vincent Di Fate, Lars Grant-West, Stephan Martiniere, Jon Foster, Adam Rex, John Jude Palencar, and Scott Fischer for participating. 55 MERCER GALLERY (55 Mercer Street, New York, New York 10013 Tel: 212.226.8513) is the venue for a group show called "Quoi Que Nous Soyons" with works created by Daniel Heyman, Don Schule and myself. We three first met last Spring as faculty at the Pont Aven School of Contemporary Art. This exhibition (conceived and arranged by Daniel) runs from October 31 - November 25, 2006 with a reception on November 4 from 6-8pm. Please come by if you happen to be in New York City. 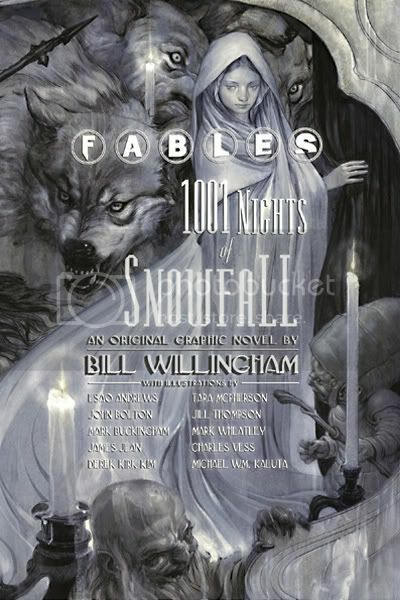 Earlier I had mentioned that Charles Vess and Michael Kaluta have collaborated on a new Fables book, 1001 Nights of Snowfall. 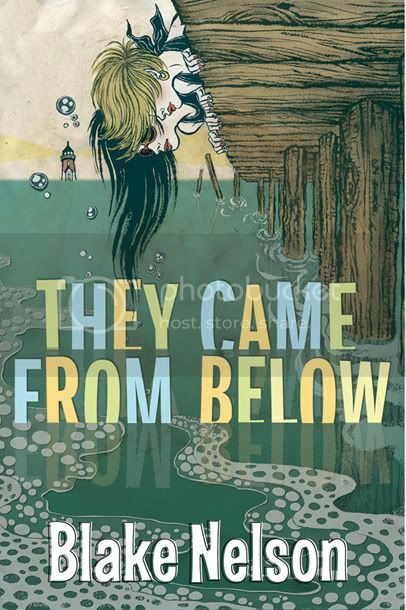 The book also features the artwork of many other artists, including this cover by James Jean. Charles points out on his blog (with more fabulous images) that it is now out and in the world...I know what I'm buying at the World Fantasy Convention. As we all know, Halloween is the second best holiday of the year after Christmas. 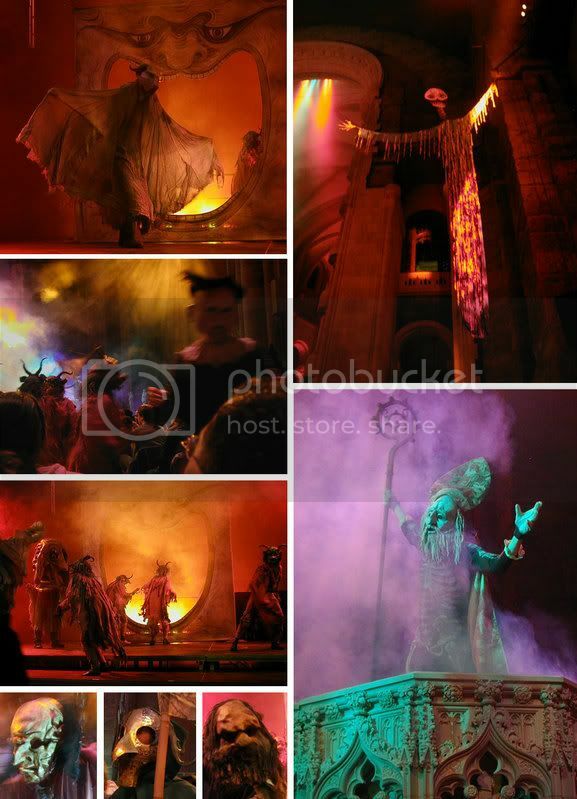 This past weekend was the Cathedral of St. John the Divine's annual Halloween extravaganza. Each year they fill the cathedral with smoke and spooky lights and play a silent horror movie (this year it was Nosferatu) with live organ music. After the movie, the real fun begins...A procession of ghosts and goblins emerges from the altar and slowly walks through the audience. It is a much cooler way to see beautifully creepy costumes than getting crushed the the parade crowds on Halloween day. 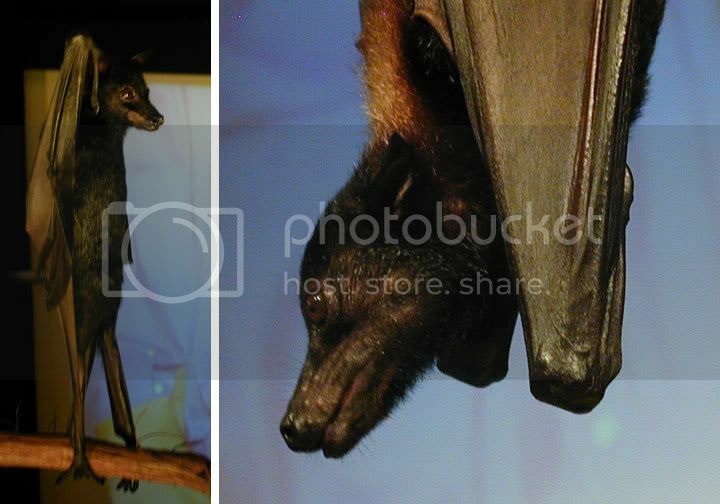 We also went to the Museum of Natural History for a lecture on bats. The lecturer brought a few live bats to show off. I'll admit that the average attendee was seven years old but, I didn't care, it was really fun to see these guys close up. Next up: Nightmare Before Christmas in 3D and Wicked! Christmas is decidedly more mellow. There is a Christmas tree and fireplace and I never venture more than three feet from either. Two high school girls are on vacation and looking for boyfriends...instead they find sea creatures that look like Brad Pit. Yuko Shimizu did the drawing. As you can see here, Yuko is amazing. Peter "no less amazing" Lutjen did the type layout. The top one is the final. I was very tempted to go with some of the other versions, but in the end I think the added elements compete with the art too much -- you are either looking at the art or the type, but not both together. The simpler type does a better job at complimenting the art and making a cohesive package. This book will release next summer. Only a few bookstores have seen it at this point but, so far, they are raving about it. Each season there is a cover that I love but I assume that others wont pay much attention to...And every now and then I'm wrong. A few seasons ago that cover was When Gravity Fails. 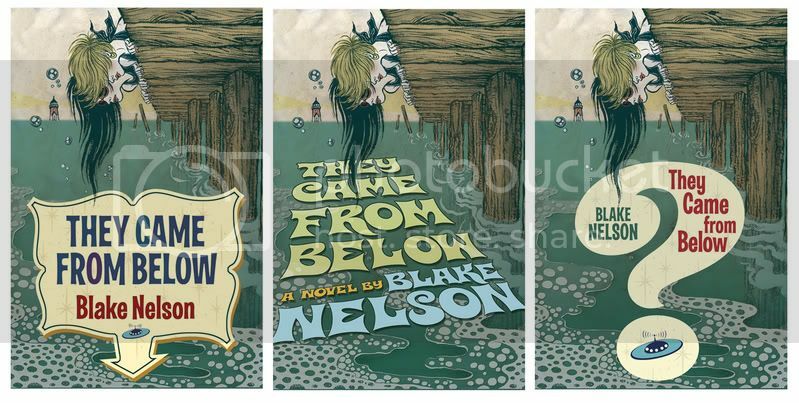 I was very surprised how well our Sales force responded to that cover...even though it was one of my favorites. Andrew Wheeler lists his favorite artists from the past year. Andrew is a World Fantasy Award judge this year and the list of nominees is very strong. I'm looking forward to seeing how it turns out next week....Just about any outcome will be good news. Spectrum 13 is out on the stands and it's bigger and better than ever - great paintings from the people we expect to look forward to and a lot of new names...or at least, new to me. It's longer and has more full-page images than in past editions...I say this every year but, this really is the best one yet. I attempted to start naming particular pieces but the list got too long. I am happy to say that Tor has 18 pieces in the book category. Along with the artwork there is Arnie Fenner's "year in review" and essays on Katrina, the Spectrum Exhibition (more on that soon), Byron Priess, and this year's Grand Master award winner, Jeff Jones. Everyone with an interest in science fiction and fantasy should run out and get a copy. Nothing will keep you better informed to what is happening in the field's artwork better than the Spectrum annuals. Photo: Book gold and silver awards, Jon Foster and Michael Deas. Editorial gold and silver awards, William Stout and Yuko Shimizu. Tom Kidd has announced an exhibition of his work at the Center for the Arts in Homer, NY. He has thirty-nine paintings on display. 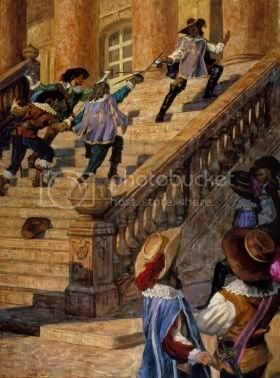 The paintings are split into four categories: book covers, illustrations for The War of the Worlds, The Three Musketeers, and Gnemo. The Center for the Arts is very pleased to announce an exhibit of works by fantasy artist Tom Kidd. There will be an opening reception for Mr. Kidd October 27th from 7 - 9pm. 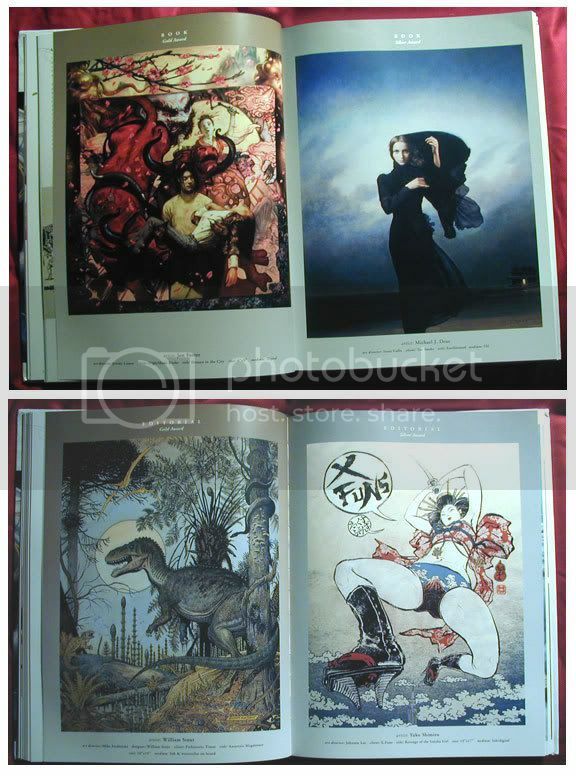 Also books and prints of Mr. Kidd's work is available. Thanks, John, for the thanks to Shelley Eshkar! It gives me an excuse to point out that he and his collaborators -- together the OpenEnded Group -- are the cover story on the new Print Magazine. 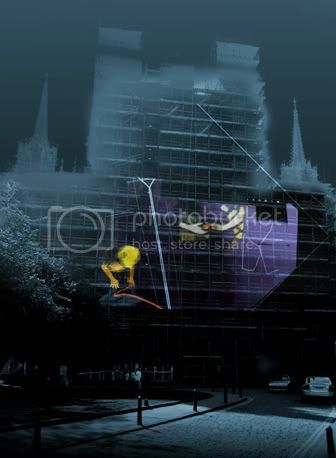 Interactive projection and lighting on the east facade of the York Minster will appear in the last three weeks of January 2007 in York, England, in a project commissioned by the York Renaissance Project. 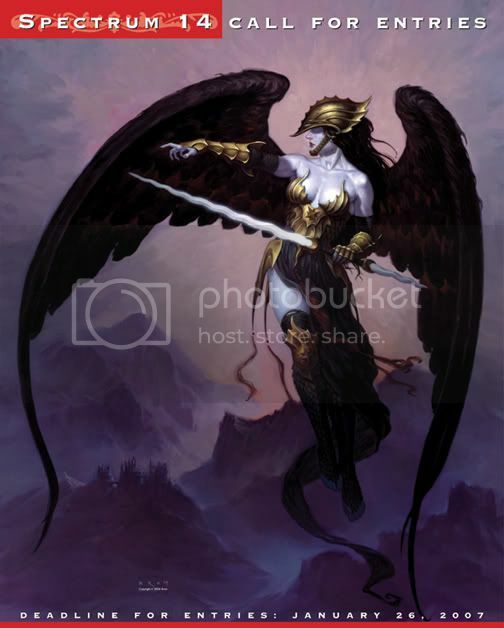 Brom's artwork will be a "bad influence" on character on the Fox TV show Justice, Monday the 23rd. Unfortunately I don't have a TV so I'll miss it. Brom fans, have fun! Mead is a very relaxed and eloquent speaker. He started off with a few childhood drawings. His love of cars was evident back when he was in single digits. Out of college, he worked for Ford designing speculative cars. Then he moved on to show some amazingly opulent designs that he created for various Middle Eastern kings' airplanes, luxury yachts, etc. My favorite part of the lecture, of course, was him taking us through the Bladerunner world, including a bunch of scenes that never made it into the film. Unfortunately he did not go into any of the other films he worked on. He did show a lot of personal work -- scenarios with future cars, moving villages, luxury space travel. He mostly showed his gouache paintings, but he did show some very complicated line drawings -- explosions of solid black lines. (I'm kicking myself for not getting a shot of one.) It was amazing to then see the color final and how much sense he could make of that drawing. 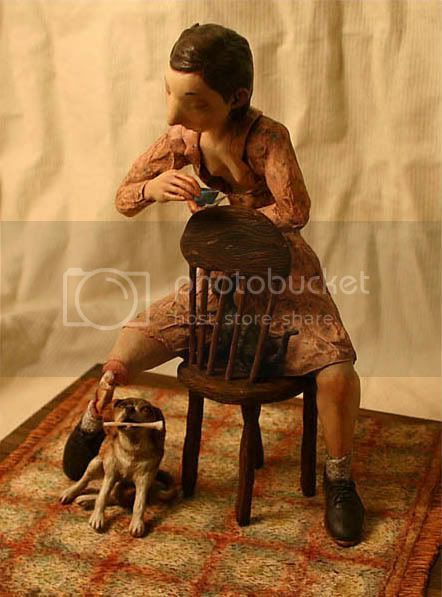 He often used the word "scenario", he said his leg-up in the concept design world was that he is able to illustrate the design problem within a scene. He kept repeating that he "layers the weird on top of the familiar to make the scenarios believable." This is a good lesson for some younger artists...I often see creatures or ships that are so estranged from anything familiar that's it's hard to relate to it. It was fun to hear all the narratives that Mead had for each element of his paintings....he clearly "lives" in the paintings while he is doing them. As he said, no one need be able to extrapolate all of that from the work, but somehow the thoughtfulness comes through. A great evening...A great crowd, clearly an adoring crowd. Many of the people there grew up on his vision of the future through the movies he worked on. I heard a few working artists in attendance say how depressed they now are...depressed with a smile. 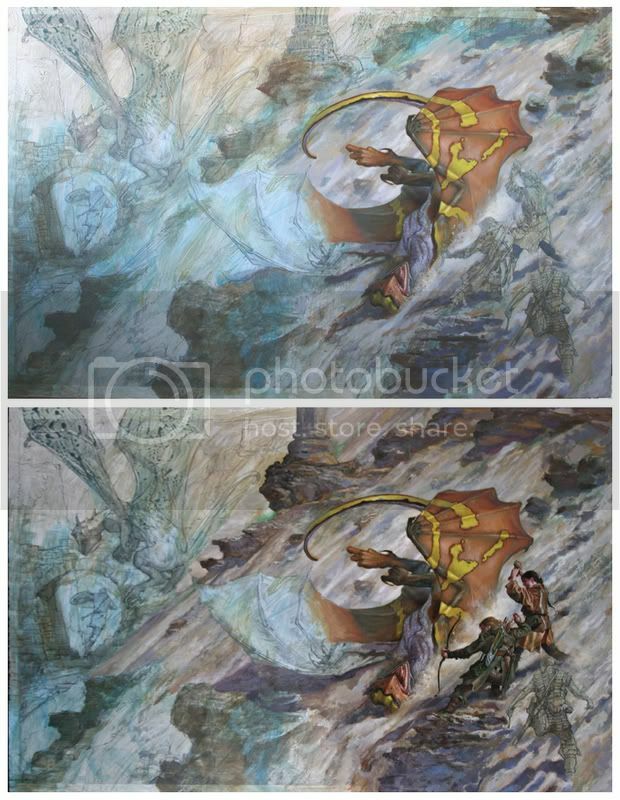 "Selecting the precise moment to freeze in order to illustrate the tensions of conflict is one of the most difficult jobs in narrative illustration. Rewind the moment too far back and you’ve lost the posturing of battle. Fast forward too much and you've provided the viewer with the resolution. 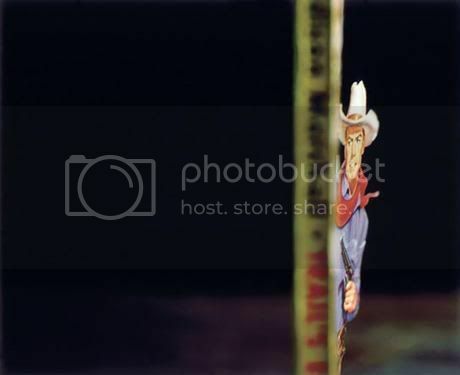 Ambiguity is the essence of what I am after within this context, the placement of the viewer and characters at that pivotal moment when there is no winner or loser. This unknown state allows the viewer to project their own assessment of the variables and guess at a possible future; the image engages and creates a dialog with the viewer. 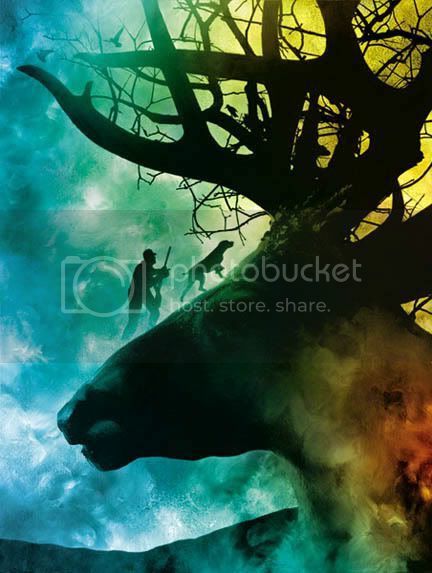 It also propels them to discover the ‘real’ outcome of the narrative, especially if there is an implied resolution as within the pages of a novel, for which this image actually illustrates. Want to know what happens?...I suggest you read the book." 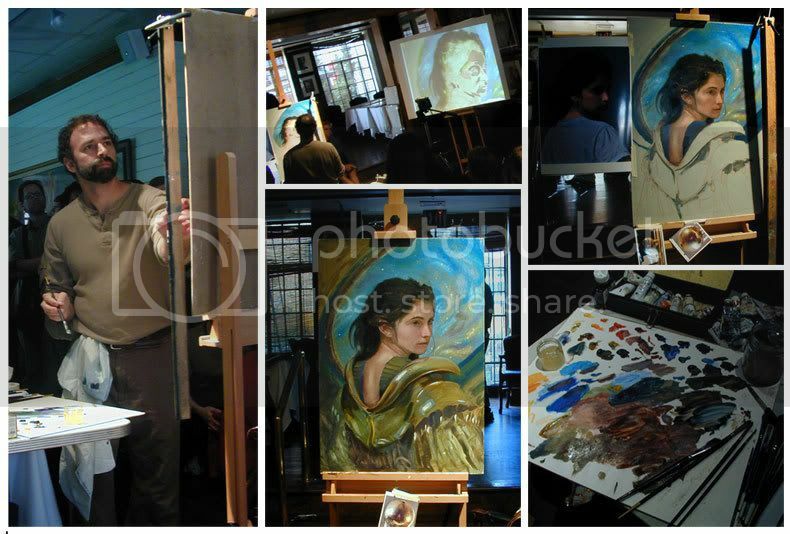 A week ago Saturday we held the third Art Out Loud series of painting demos at the Society of Illustrators. 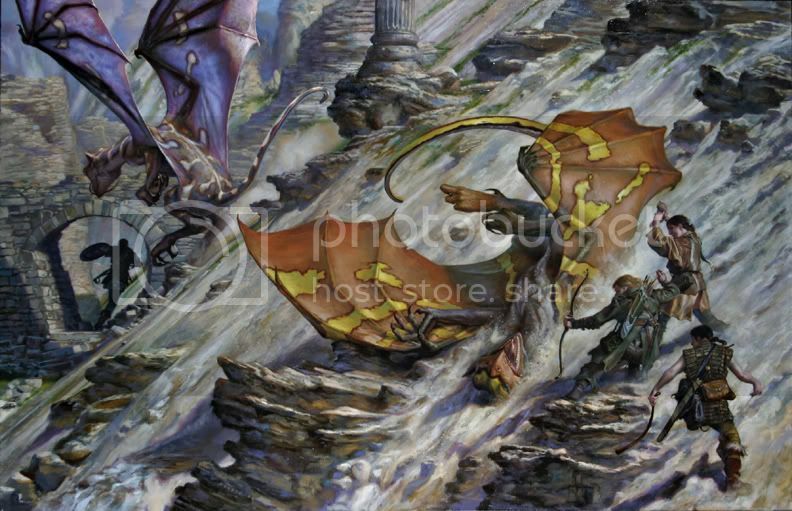 This one featured Donato Giancola painting with oils and Todd Lockwood painting digitally. While many convention panels like to pit digital and traditional painting against each other, we wanted to show how similar they can be. We had a sold-out crowd of students and artists, including Bruce Jensen and Tristan Elwell. Most came in from the tri-state area but others did come in from Boston, DC, Utah, and Zoltan Boros & Gabor Szikszai (recent Chesley award winners) get the prize for flying in from Hungary just to attend. 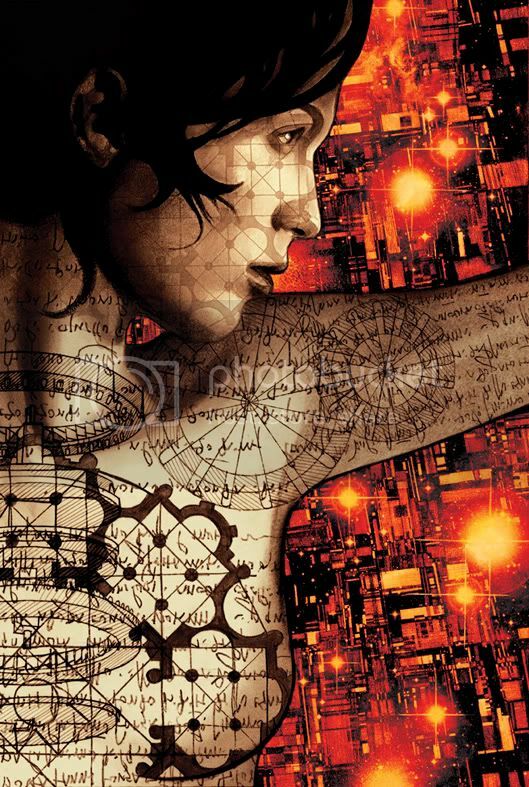 Donato painted a science fiction female portrait with a slight fantasy feel to the costuming. Todd recreated a Drizzt cover from the popular R. A. Salvatore series. Both artists came close to finishing the painting, which is remarkable in just four hours. (And not expected in a demo where they spend as much time talking as painting.) We projected the artists working so that it was easy watch both paintings develop at once. They both started with some simple reference and worked their images up from that. I, for one, always appreciate it when profesional artists share their reference. Too many students think they need to pull details out of thin air and that looking at an object is, somehow, cheating...Which is nonsense. ...All in all, a great time! I'd like to thank Todd and Donato for giving up their time to share their techniques with others. I'm sure they could have utilized that time for working or relaxing with family, instead they gave up their day to give back to the community. I'd also like to thank my tireless co-chair, Dan Dos Santos -- his optimism and my skepticism seems to be the recipe for a well balanced event. And, of course, thanks to Greg for helping out in everything that I volunteer for...without ever complaining. Photos: The crowd. Todd Lockwood, Todd painting, painting with reference, Todd with Greg and Bruce Jensen looking on. Donato Giancola, Donato projected, painting with reference, nearly done, palette. 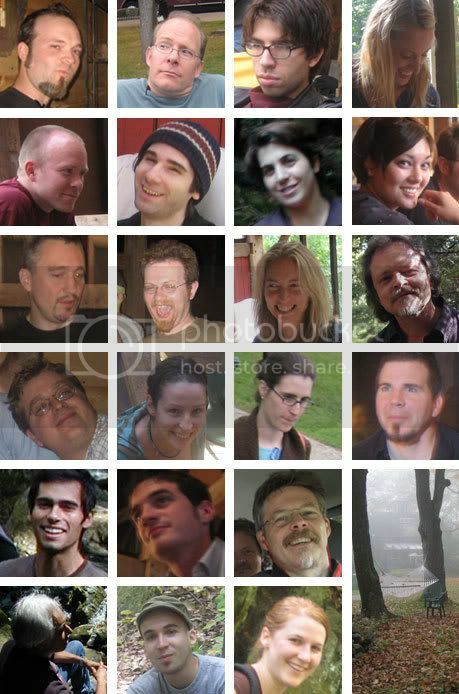 For many more photos, check out this thread on Conceptart.org -- scroll down on page three. Next up, November 11. Art Out Loud 4 with James Bennett, Gary Kelley, and Greg Manchess! Favorite painting you did in the last year? A tie: The cover for The Empire of Ice Cream by Jeffrey Ford, because I felt like I finally made a few breakthroughs in my drawing and painting on that one; and the cover for A Canticle for Leibowitz by Walter M. Miller, Jr. , the book's a literary classic and I liked the pressure of coming up with a fresh take for a novel that's already had past covers by folks like Milton Glaser and Lou Feck. Three off the top of my head, Dreamtigers by Jorge Luis Borges, a Batman cover, and an all-ages illustrated book. I once read an interview with Brad Holland, where he said that he prides himself on being able to take any subject, familiar or unfamiliar, find some interesting perspective on it, and explore that in a given illustration. I like that. I try to approach my jobs the same way...so I would say it definitely helps to like the book thru and thru, but it's not the overriding factor. I think there's always a core of strengths in any book though, and I'm looking to capitalize on those things for the cover. The 30th Anniversary edition of Michael Moorcock's Behold the Man, Mojo Press, 1996. 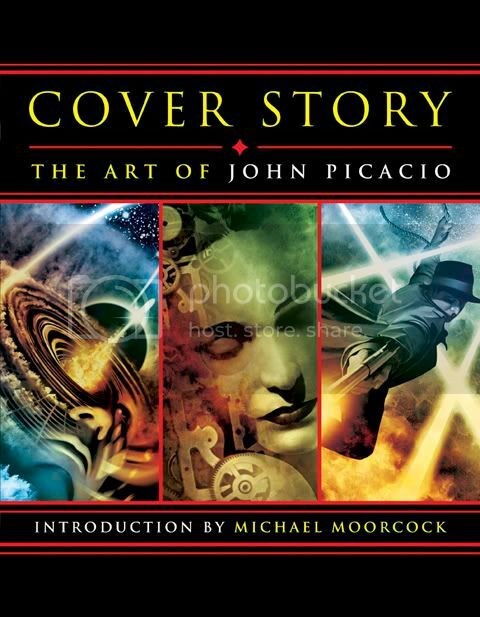 Designing the entirety of my own hardcover art book, Cover Story, The Art of John Picacio, and knowing that I was responsible for every square inch of illustration and design in there...thanks to MonkeyBrain Books for publishing it. Several things, including finishing a cover for Sheri S. Tepper's new novel The Margrets, starting a triptych cover for the re-release of Jeff Ford's Well-Built City trilogy, and starting the research for the most exciting book job of my life thus far (stay tuned). Greg and I will be at the World Fantasy Convention this year. I'm looking forward to this even more than usual. The artists line up is fantastic. Two artist guests, John Jude Palencar and Gary Gianni. 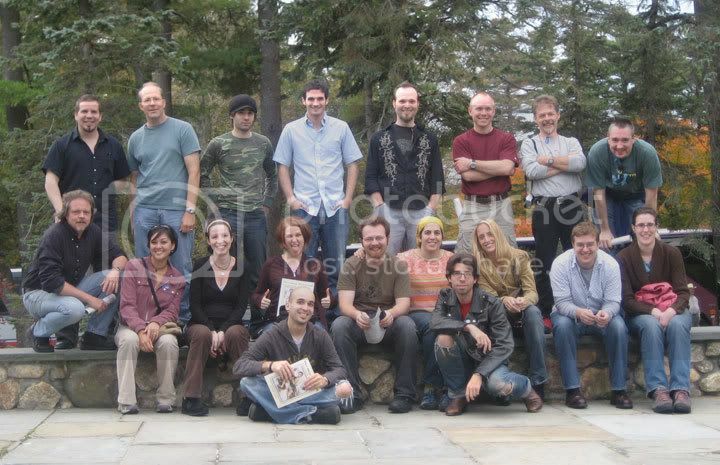 Plus, Greg, Charles Vess, John Picacio, Mike Dringenberg, Gary Lippincot and others. And, the Franks from Worlds of Wonder and the Fenners from Spectrum. It should be a particularly rich art environment. Sun 2:30 PM-3:30 PM: Art in the New Millennium: What is an Original? 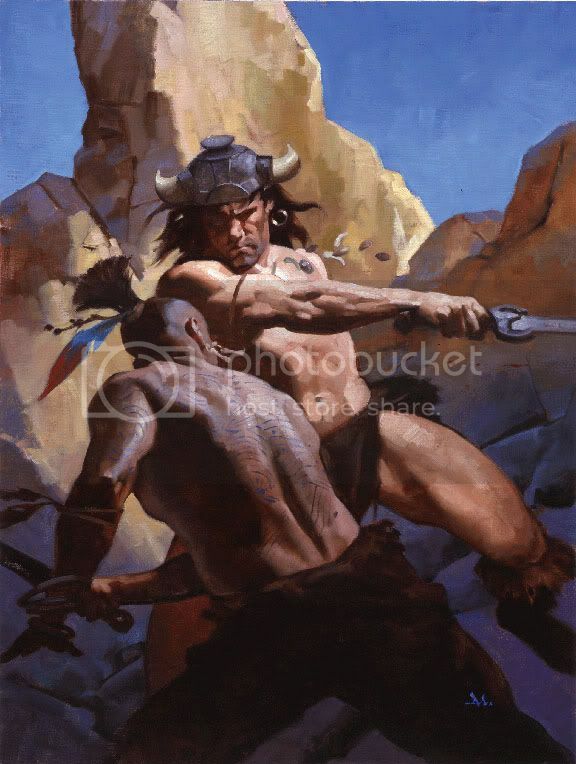 In celebration of Robert E. Howard, the image above is from Greg's recent paintings for Conquering Sword of Conan. He'll have some of these paintings on display in the art show. A few people have emailed me the heads-up on the new CGSociety challenge. (Thank you, guys!. I very much appreciate the input.) CGSociety is running a contest to visualize Greg Bear's Eon. Greg Bear will be one of the judges. 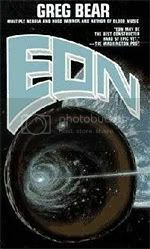 Your challenge is to create material for the promotion of a (potential) blockbuster film based on EON, a novel by highly acclaimed writer Greg Bear. Expanded to three categories: Illustration, 3D Scene and Film Trailer, the challenge is to put great words into great pictures using 2D, 3D or video format. Those of you with computer skillz, the deadline is January 15th. . The contest website has a very comprehensive synopsis, setting descriptions with visual inspiration, forums to talk about the contest, and you can already see some of the entries. I've never explored CGSociety.org as much as I should...This just might be the project to dive in with. 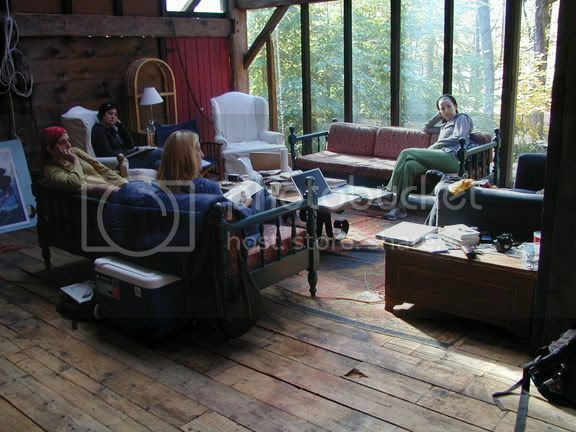 Thursday: everyone was very mellow in the morning. Rebecca Guay read us the first chapter of a comic book that she is writing as well as drawing...Not only is she a wonderful artist but this story is so funny and charming I cannot wait to see it done. Her reading of it was priceless...anyone that meets Rebecca must ask her to read it to you. Scott Fischer surprised me by bringing in the final John C. Wright "Chaos" cover. It may be my favorite of the series. A frisbee was thrown, more food, and an earlier night. Friday was a nice long goodbye. We all had a final relaxing breakfast...which somehow rolled into a final relaxing lunch and then back to New York to prepare for the following day’s Art Out Loud demo with Todd & Donato. Despite all of the above, I was impressed with how much work got done. (By others, not me.) A few of us were in much-needed vacation mode, but the majority of the group was very focused. (I'm sorry to have avoided showing the paintings here but I'm not sure who was working on projects that clients may not have seen yet.) It was particularly exciting to be in a group of artists at so many different stages in their careers. Artists typically work in isolation...It was clear that everyone enjoyed being able to walk around, look at other people’s work and chat while taking breaks. 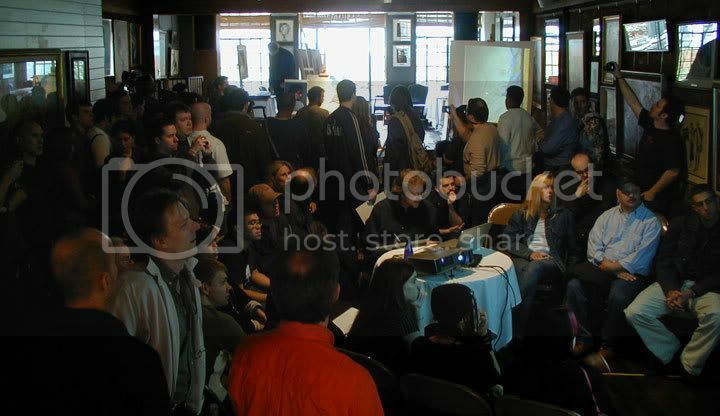 Todd was the only one working digitally but most everyone sat down with him at some point for a private tutorial. All agreed that it was the most refreshing and energizing week that we could have hoped for. We already miss our barn. Pictures: Scott Fischer with his cover for John C. Wright's Titans of Chaos. At the Rockwell. Relaxing in the barn. Outside the barn. Everyone: Scot F., Dave S., Dave P., Rebecca / Lars, Scott A., Me, Jinju / Cyril, Arkday, Julie, Todd / Mark, Christina, Sara, Jon / Tony, Scott B., Greg / Boris, Dan, Tiffany. I was basically internet free for the week. After I got over the shakes, it was kinda great. But!, I'm excited to get caught up tonight and tomorrow night. 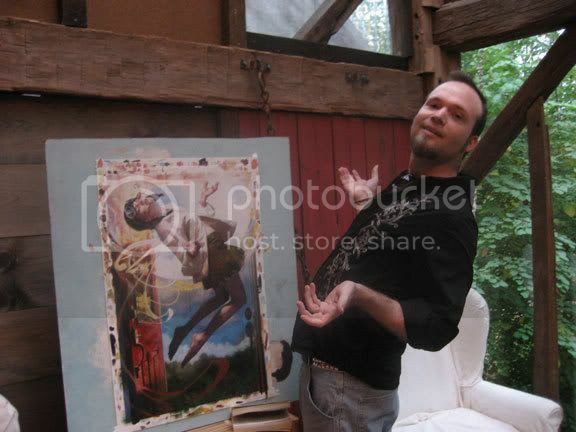 I've got some great shots from the retreat and the Todd Lockwood and Doanto Giancola Art Out Loud demo. Here we are, at the fantastic Race Brook Lodge. I'm glad to say some work is actually getting done...I'm even more glad to say that I am not doing any of it. It's been such a great few days. We've been hiking and eating and talking... the more focused among us have been working. Julie Bell and Boris Vallejo are working on their next calendar, Scott Brundage got a job from The Wall Street Journal while we were out for lunch, Tiffany Prothero is working on a piece for a ConceptArt calendar, Tony and Dave Palumbo are working on paintings for a gallery exhibit in Philadelphia, Todd Lockwood is working on a poster image for a tattoo company, Dan Dos Santos is working on a number of things, including a cover for Tor, Scott Altmann and Arkady Rotyman are working on various projects, and Greg is working on some thumbnails for a new children's book. Top to bottom: Greg in the barn. Painting in the barn. Julie and Todd. Dave. Everyone at the waterfall. Todd and Dan. Boris. Todd Lockwood flew in late last night. We were supposed to spend today doing fun New York things, like visiting museums and such. Instead, we were held captive in Greg Manchess' apartment waiting for Delta to drop off Todd's lost luggage, including all of his painting supplies. What a pain. It was the only full day he had to explore the city. Instead, we hung out and watched a lot of Buffy the Vampire Slayer...Which is a good day for me but not what Todd was expecting, I'm sure. Todd has come into town a week before his painting demo at the Society to take advantage of a working retreat organized by my friend Dan Dos Santos. 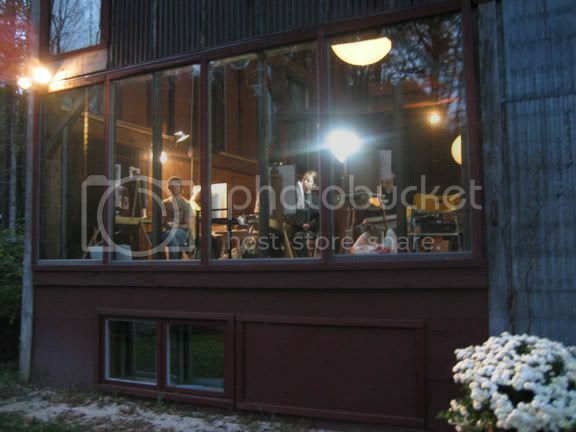 Dan found a B&B with a barn-turned-meeting space up in the Berkshires -- he talked them into a nice price and then invited a dozen artists to come on out. The group will include Boris Vallejo, Julie Bell, Scott Altman, Dave and Tony Palumbo, and a bunch of others. The idea is to get lots of work done while still having time for light hiking, reading, and Pictionary....Or at least that's the plan. In the end, I'll be just as happy to fall asleep in a hammock for much of the day.